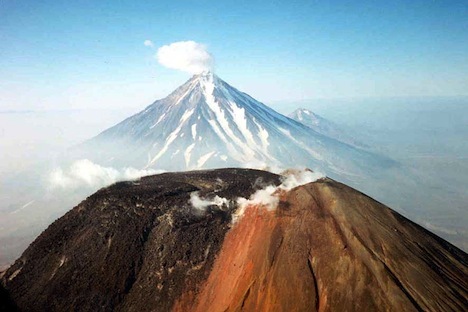 Extreme weather and rising food prices could be the result of some particularly active volcanoes in Kamchatka. Now the world has something else to gripe about when it comes to Russia – the weather. A string of volcanoes on Russia's Kamchatka peninsula have been unusually active over the last six months. The dust they threw up diverted winds in the Arctic, pushing cold air over Europe and North America and causing the unusually cold winter this year, according to scientists. The volcanoes (160 in total, of which 29 are active) are still on the go, and could create more problems this year, resulting in depressing harvests around the world just as global food prices soar and culminating with a second freezing winter next December. The eruptions have come at the worst possible time. The Pacific Ocean has already been cooled by the "La Nina" phenomenon – which contributed to the deluge in Australia and tropical cyclones – while at the same time the Atlantic Ocean is warmer than usual. Climatologist Erste Bank says the combination of these factors means the weather forecast for the first quarter of this year is extreme, which will hit both the agricultural and mining sectors, sending already spiking prices up even faster. "These climatic conditions reduce the outlooks of harvest for agricultural commodities and prevent the mining of commodities like coal," said Erste. "The extreme weather will probably culminate in the [first quarter] – this is the reason why the prices of commodities will be influenced by this weather… then an acceleration of consumer inflation… There are also problems for transport due to strong storms." The combination shifts wind patterns around the world, but the wrench in the works has been the Kamchatka volcanoes, which are throwing massive amounts of dust into the air, causing the Arctic to become even colder and Arctic winds to push farther south, resulting in a drastic change in patterns. "Kamchatka tends to be somewhat active - but recently it has been ridiculous! Since late November, Kizimen, Sheveluch, Karymsky, and Kliuchevskoi have been erupting almost constantly," Evelyn Browning Garriss wrote in the Browning Newsletter, a monthly weather publication. Volcanic ash screens out the sun, cooling the air below. This lowers air pressures, which in turn changes wind patterns, especially in the Arctic. The upshot is, according to Browning Garriss, "the cold air normally trapped around the North Pole surges south." This has caused some bizarre weather. The UK was colder than Russia on Christmas Day, while New York was buried under heavy snow. The cold weather has already impacted agriculture. Australia's wheat crop was down by 10 percent in December – the worst fall in 100 years – and Russia's agriculture ministry is forecasting a grain harvest of 80 million-85 million tons; better than last year, but still well down on the bumper 2008 crop of 110 million tons. This situation, coupled with last season's severe drought in Argentina, floods in Brazil and Venezuela, odd weather in the agricultural parts of China, has already caused food prices to soar. What happens throughout the rest of this year will depend entirely on the volcanic activity, said Browning Garriss, which by its nature is impossible to predict.